Veronica Shoemaker Rose Special. Limited Time Offer. 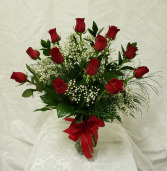 Our designers arrange a dozen of our beautiful roses in a classic 8" rose vase. We carry an array of beautiful colors to choose from. Please call us to help you with your selection of color or order on line.